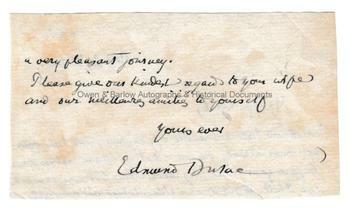 EDMUND DULAC autograph Signature and Part letter. French born British artist and illustrator. 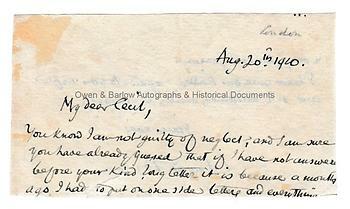 Autograph signature on partial ALS addressed to "My dear Cecil" London, August 20th 1910. Paper piece measuring 11 x 6.5 cms (4.5 x 2.5 inches). Slight browning and mounting traces, slight tear at bottom edge touching signature, else very good. Provenance: From an album compiled by Florence Pearl Faithfull (known as "Pearl"), later Lady Dilke. Pearl Faithfull was the daughter of H.M Faithfull, solicitor of Sydney, New South Wales and the grand-daughter of the Australian pioneer and politician William Pitt Faithfull. In 1915 she married Sir Charles Wentworth Dilke but following his insanity and subsequent death in 1918 she returned to Australia. Many of the autographs in Pearl Faithfull's collection have an Australian connection.